This Trip Was Such an Amazing Adventure, You Have to Experience It For Yourself to Believe It! The time and effort that went into planning this 3-day event is very much appreciated. From the very beginning to the very end of this trip, everything was top-notch! It is so difficult to pin-point my favorite part of the trip... there were so many and a lot of firsts for me. The helicopter ride down into the Grand Canyon was amazing. I am hooked, it may have been my first, but it certainly won't be my last helicopter ride, although I have no misconceived notion that any other will come close to this experience! 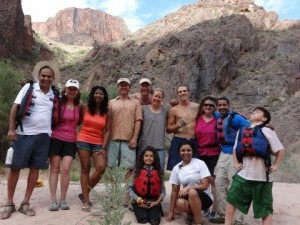 This wasn't my first rafting trip, but it was my first trip to the Grand Canyon and my first J-Rig rafting trip... what a ride... and what a way to see the Grand Canyon for the first time... there can be no better way! The fellow rafters on the trip were wonderful, I couldn't have asked for any better. I am sure groups always bond on these trips, but I can’t imagine another group bonding any more than ours. Of course, we exchanged contact information and hope that we have made some life-long friendships. And, last, but certainly not least, the guides couldn't have been any better… Evan and Alex were on my raft. They had such a wonderful way of sharing their wealth of knowledge that was neither boring nor arrogant. They were such a joy and I could see how much they truly love what they do. Western River, you have an amazing team, thank you so very much for a wonderful experience… it is so cliché, but truly, it was the trip of a lifetime!! !